The District of Sechelt is located on British Columbia’s Sunshine Coast approximately 67 kilometers from Vancouver by road and ferry. The District has a population 9291 within an area of 39.01 square kilometers (Statistics Canada, 2011). Sechelt is a destination for a number of outdoor activities including fishing, golf, and scuba diving. The District has two departments within the organization that manage physical assets: Parks and Engineering. These two organizations provide services such as grooming the parks and maintenance of water and sewer infrastructure. This work is performed by approximately X staff members and is managed by three supervisors and one manager (COO). As with many municipal governments. Sechelt is struggling to increase efficiency to provide tax payers with the most value. The District employs two separate systems that allow them to manage their work and assets (ESRI’s City Works) and to deal with their Payroll (Ceridian Day Force). These two systems are very good at what they are intended to do but there was a missing piece; a mobile interface that allows crews to enter time that posts to either or both systems. This meant that crews would log their time on paper forms and then a finance staff member would have to transpose them in the payroll system and potentially another staff member in the work order management system. This was a very inefficient system prone to a number of misuses including transposition and data entry errors. The i-Open worXLog tool allows organizations in many industries to track their Jobs, and Personnel as well as users to log their time and equipment (T&E) through a single unified interface. Leveraging the worXlog application, municipalities can now track and manage work orders within ESRI’s City Works, or any other work order management system. Alternatively, the worXlog T&E module can be deployed as a stand-alone application that ties in to the organizations existing systems. Within the District of Sechelt requirements, as a critical part of the implementation, i-Open tied critical business rules to the application. These rules helped to ensure the data entered is valid; rules such as maximum time worked before time is considered overtime and which work orders are standing versus those that are project based. In the case of the overtime rules, the business rules are implemented in such a way that the crew member entering the time is guided to enter additional time as overtime and ensures their time is logged correctly. Additionally, there are data validation rules to ensure time is entered in an appropriate manner. These database rules also ensure the data collected integrates seamlessly with other vendor systems. Mapping to the existing business processes, the District of Sechelt T&E implementation of the worXlog system allows their crews to track time in the field, subsequently review and sign for the time, after which a supervisor and manager can review and accept the time or adjust time. This digital signature system provides a track-able history through the process. This means that finance staff and managers can evaluate their process and ensure that time is being correctly tracked and entered into their systems. 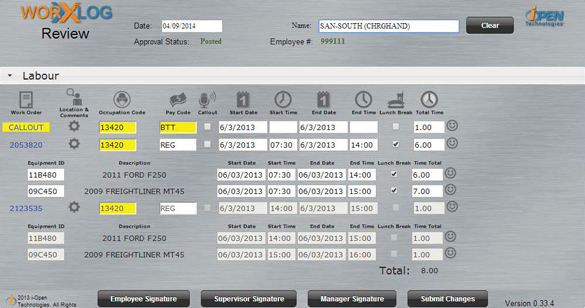 All staff can be confident that their time and the time of their charges is being logged and recorded correctly. This also gives the user flexibility to adjust time so the final committed time will be an appropriate representation of reality. Finally, the time can be reviewed in summary based on a number of parameters, reviewed by the clerks to see all time is properly approved and then posted to their payroll system. The District now has a fully integrated system that allows their work crews to record time worked as they work, review and post the time and have it show up in both their work order and payroll systems. This has allowed the system to be less prone to errors, give finance staff and managers more real time analytics and reduces the stress on work crews for entering this critical operational information. When any organization is required to manage or monitor work time, it is critical that it be done in a fully integrative way or it will be no more effective than old paper based systems. By integrating the Time and Equipment solution with the Districts work order and payroll systems it ensures that mission critical information is available to relevant staff in near real-time.